Imagine yourself passing through the Roaring Forties, sailing alone in a 60 foot yacht in high seas near Cape Horn, with only your skill and equipment separating you from danger and possible disaster. 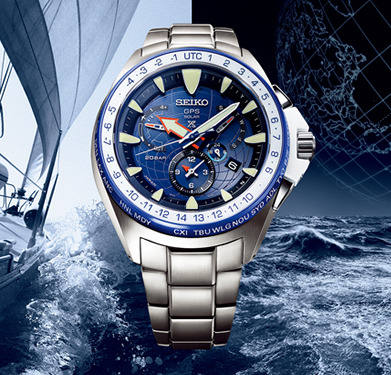 This is the prospect faced by ocean yacht racers like Kojiro Shiraishi, who has helped Seiko to create the new Marinemaster GPS Solar sailing watch. Knowing the exact time and time zone at sea is vital so that communication with the team back home can be synchronized, even in the waters near the poles, where time zones change with far greater speed than at the Equator. 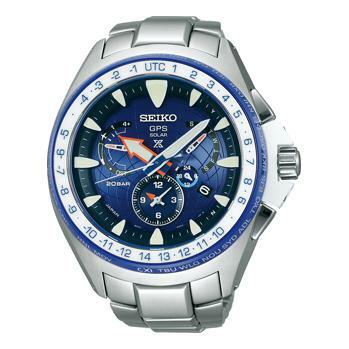 This new watch marries Seiko’s proven skill in building watches suitable for the most demanding environments with a new timing technology that ensures that, with one touch of a button, the watch adjusts to the exact local time anywhere on earth, on land or at sea, using just the power of light. Furthermore, the Dual-Time function allows an ocean sailor to know at a glance the time in his or her home port as well as local time. The new Marinemaster GPS Solar is built for the harsh conditions that every ocean racer has to foresee. The case and bracelet are made of corrosion-resistant titanium, protected by a super-hard coating and a ceramic bezel. 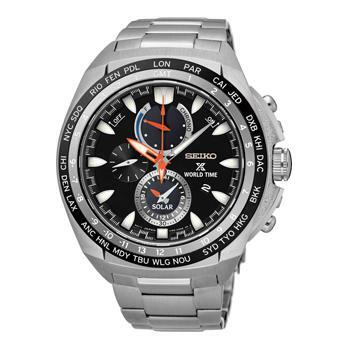 The watch is 20 bar water resistant, with a screw-down case back and crown. 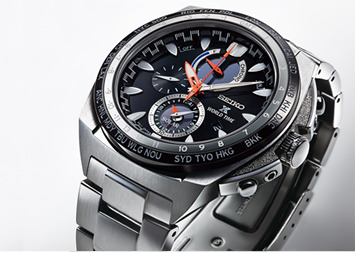 Excellent legibility in any weather, day or night, is ensured by the sapphire crystal coated inside and out to minimise glare and reflection, the wide, prow-shaped markers and Seiko’s latest Lumibrite coating. Complete ease of use was the designer’s next concern. The crown and buttons are easy to use, even when gloves are worn and the case and bracelet are shaped to avoid any edge catching a rope or line. This very special watch is offered in a limited edition of 1,500. Alongside the Marinemaster is a new series of three solar chronographs, sharing the same design elements and also offering the level of professional specifications that the name Prospex implies. The caliber is perfect for the global sailor. It shows both local and home time simultaneously in a simple dial layout and never needs a battery change, drawing all the energy it needs from light alone. 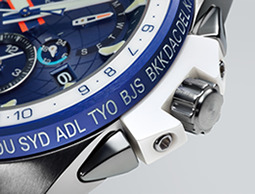 A power reserve indicator reassures the sailor that the watch is powered sufficiently. The case is 10 bar water resistant and is protected by a screw case back and a screw-down crown, which is itself protected by a special crown guard.